« What’s the Cause of My Heating Inefficiency? Those individuals living in warmer climates may think that snow is the major issue around here in the winter. It’s a big one, obviously, but ice is as big, if not a bigger, problem. 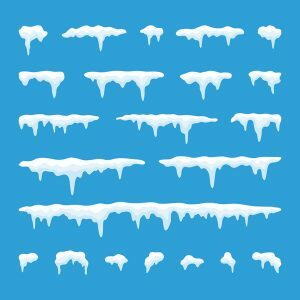 When temperatures warm up and then drop back down to below freezing, snow can melt and then freeze back up. You may have heard the sound of snow dumping off of your metal roof at night, only to awake to an icy mound at the back door in the morning. Depending upon where the outdoor heat pump unit on your property is located, it is possible that water is dripping on it from the roof or even through gaps in your patio’s boards. If this is the case, then that water dripping onto the unit can then freeze up on it. Don’t try to chip away at this ice, particularly if it is on the coil or refrigerant line. You risk doing serious damage to your system. You should be sure to remove snow from the unit and from the surrounding area, though. Did you know that it is actually perfectly normal for some frost or even a thin layer of ice to develop on your heat pump in the winter? This should put your mind at ease a bit, but only if the occasional issue resolves itself. Because frost and ice are expected to build up from time to time, there is actually an automatic defrost cycle built into heat pumps. When functioning properly, this defrost cycle should melt away frost and ice in its early stages. If your system seems to be growing a thicker and thicker shell on it, then you should definitely be concerned. Again, do not try to chip away at the ice yourself. Do not grab a heat gun or a hair dryer and try to melt it on your own. And, while your heat pump has an emergency heating option that will use electric resistance heating to keep your home warm, you don’t want to be reliant upon it. It is going to be costly, due to the cost of electricity. Instead, reach out to our team for reliable heat pump repairs.